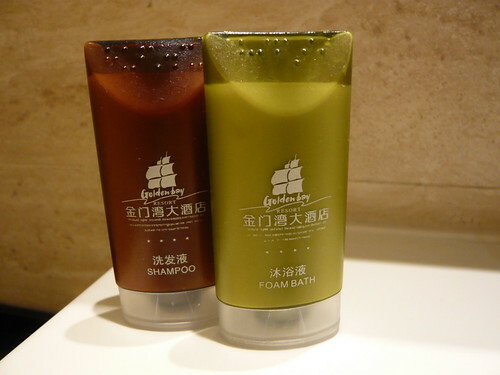 This pair of bottles is from the same hotel where I stay in Xiamen as per my previous entry. I like the Braille dots at the tip end of the bottles. Nice touch. Blind folks shower and shampoo too! However, it is actually the bottle of foam bath that got me thinking and writing this blog. If I recall correctly back in the day before shower gel was invented, we had soap bars in the hotel. Yet, the bottle of foam bath exist then too! The only difference is that back then, the foam bath is actually use for the bath tub for that soothing bubble bath that all char bors are so fond of (check out Minnieve's profile photo). Today, at many hotels, foam bath and shower gels are used interchangeably which I find it weird. If it was not meant to be used as a showering agent (agent?) back then, then how is it now that it is accepted as one?